New York: History would have been made at the US Open women's final no matter how it ended, but no one could have predicted the chaotic manner in which it played out. Tears, boos, anger and accusations overshadowed a remarkable victory by Naomi Osaka, who defeated Serena Williams, 6-2, 6-4, on Saturday to become the first Grand Slam singles champion born in Japan. Osaka, 20, moved to the United States at age three and grew up idolising and emulating Williams, who was seeking a record-tying 24th major singles championship. But in what should have been a moment of uninhibited joy for Osaka, she shed tears of sadness while standing on the podium after the match. The celebration was tarnished by the booing from fans upset over what they perceived as unfair treatment of Williams by the chair umpire, Carlos Ramos. The outcome of the match seemed clear early on, after Osaka won the first set and demonstrated a steely nerve in the face of daunting pressure. But in the second set, the match descended into chaos, all instigated by the slightest of hand gestures. Williams approached the chair to tell Ramos that it was a "thumbs-up" gesture and that she would never accept coaching on court, which is against the rules of Grand Slam events. "I don't cheat to win," she said in a stern tone. "I'd rather lose." During the next changeover, tensions seemed to simmer down during a civil exchange when Williams explained to Ramos that she understood he may have interpreted some coaching but that none actually existed. Williams went back on court, held her serve in that game and then broke Osaka's serve to take a 3-1 lead in the second set. If she could have consolidated that break, it might have turned the flow of the match. But Osaka broke right back, and after the game ended, Williams destroyed her racket by throwing it to the court in anger. That resulted in a racket abuse penalty, a second code violation for which the penalty is a point. Osaka would start the next game ahead by 15-0. When Williams realised that, she argued more and demanded that Ramos apologise to her and make an announcement to the crowd that she was not receiving any coaching. Ramos, known for his no-nonsense approach, did not relent. When the next changeover came, with Osaka leading by 4-3, Williams, still visibly distraught over what she perceived as unfair treatment, told Ramos that he had stolen a point from her and called him a "thief." For that, Ramos gave Williams a third code violation, which meant she lost a game. Without swinging her racket, Osaka was now ahead, 5-3, and one game from the championship. Williams did not appear to realise that Osaka had been given the game until she reached the baseline again. Now fuming, she returned to the chair and demanded to speak to Brian Earley, the tournament referee, and Donna Kelso, the WTA supervisor. Fighting back tears as the crowd yelled, hooted and booed, Williams pleaded her case. She said the treatment was unfair and argued that male players routinely behave in the same manner without facing penalties. "There are men out here that do a lot worse, but because I'm a woman, because I'm a woman, you're going to take this away from me? That is not right," Williams told one official. Later at a postmatch news conference, she accused Ramos of sexism for issuing a code violation for her "thief" accusation. Mouratoglou acknowledged giving her coaching instructions from the box but also said he did nothing more than what every other coach does. He added that Ramos overreacted and should have quietly requested that Williams tell Mouratoglou to stop. "That's what umpires do all year," he said, "and it would have ended there, and we would have avoided a drama that was totally avoidable." When told in her news conference that Mouratoglou admitted to coaching from the box, Williams disputed it, saying they had no preplanned signals. "I'm trying to figure out why he would say that," she said. Ultimately, Williams held her serve at 3-5, but it was Osaka's turn to demonstrate uncanny focus for such a young player, to block out the swirling tension and close out the match on her own serve. When it was over, Osaka's celebration was muted. She climbed up to her box and hugged her mother, who was crying, and then came back on court for an awkward trophy ceremony at which no one seemed pleased. 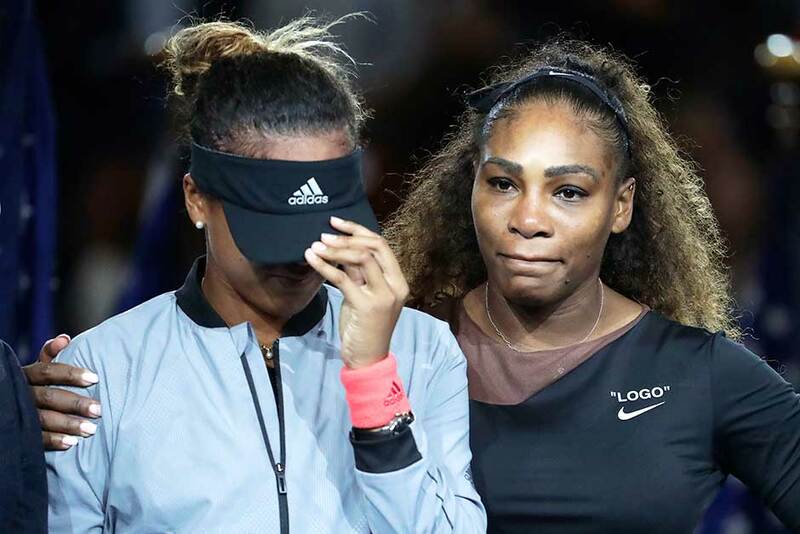 As the players stood next to each other, fans booed when the master of ceremonies began to speak, and Osaka pulled her visor down over her face and cried. Seeing how upset Osaka was, Williams moved over and put her arm around Osaka and later pleaded with the fans to be more gracious. "Let's give everyone the credit where credit's due and let's not boo anymore," she said to the fans. "We're going to get through this, and, "Let's be positive. So congratulations, Naomi. No more booing!" She then added cryptically: "I hope to continue and play here again, but we'll see. It's been tough for me here, but thank you so much." Osaka's dream growing up was to play Williams in a Grand Slam final and to win it but not under such heated circumstances. "I know that everyone was cheering for her," she told the crowd, referring to Williams. "I'm sorry it had to end like this. I just want to say thank you for watching the match."